Mobile Business Intelligence (BI) adoption is on the rise. And, traditionally, BI has been the domain of large enterprises – principally due to enterprise grade expenses. SearchBusinessAnalytics.com’s 2011 BI Challenges and Priorities Survey found that 39% of respondents planned to add Mobile BI capabilities to their organization in 2012 – a fourfold increase over current adoption levels recorded by the media organization. But, with new-generation vendors, new-generation products and pricing models emerging, it appears that small to midsized businesses (SMBs) are only too keen to take advantage of mobile reporting and analytics. The increased interest in Mobile BI probably shouldn’t come as a surprise, given the increasing emphasis on enterprise mobility. In fact, Gartner has stated that smartphones and tablets will represent more than 90% of the new net growth in device adoption over the next four years. A recent study by market research firm, Techaisle, found that 22% of SMBs currently use BI solutions, and another 27% intend to deploy within the coming year. More specifically, the report also discovered that 18% of those SMBs currently using BI are also planning to deploy Mobile BI programs in 2012. However, the study also revealed that many SMBs are unsure of how to best leverage mobile applications and the associated costs of delivering BI to mobile devices. Mobile BI is an extension of enterprise BI. So, select a vendor that offers Mobile BI capabilities at no additional cost. Ensure your vendor offers a range of native applications and browser-based options in order to support a number of different operating systems and devices. This will increase the likelihood that you can simply utilize existing mobile devices and/or implement a cost-saving BYOD (bring your own device) program. 2. a) Choose a vendor with native support for Apple devices: See point five in our blog, 6 tips for a successful Mobile Business Intelligence deployment. Select a vendor whose mobile solution does not require any re-work of existing BI reports in order to deliver them to mobile devices. This will help save on ongoing development and maintenance costs. See our blog, 10 don’ts for delivering Mobile Business Intelligence, and point seven – ‘Attempting to rollout Mobile BI to all users’. 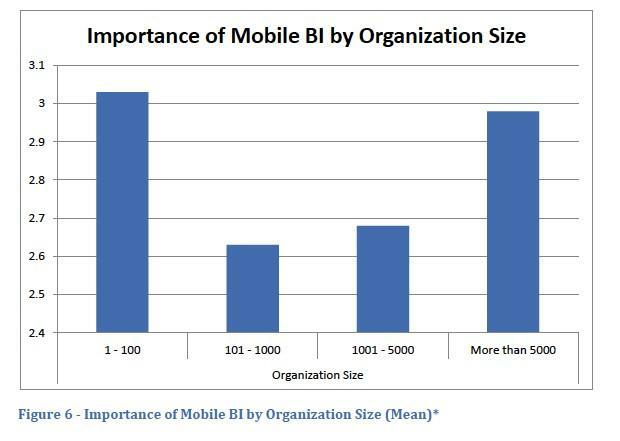 Interestingly, Mobile BI guru Howard Dresner found that smaller organizations place an even higher degree of importance on Mobile BI than larger businesses. Dresner’s latest Mobile Business Intelligence Market Study revealed that businesses with between one and 100 employees consider Mobile BI more important compared to any other sized organization on a four point scale. Responses were weighted from four (where respondents considered Mobile BI to be “critical”) to one (where respondents considered Mobile BI to be “not important”). Dresner suggested that this result was due to the agility and flexibility of smaller organizations, and hence their ability to “more readily integrate new technologies into their businesses”. 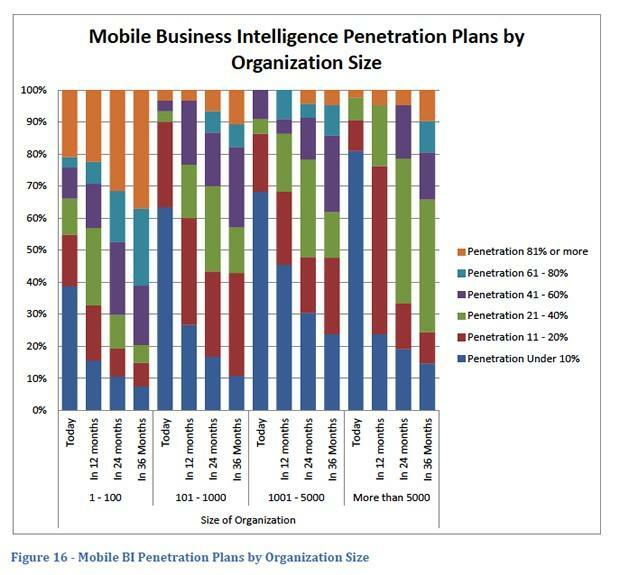 Again, Dresner’s October 2011 study found that while organizations of all sizes have significant plans for adopting Mobile BI initiatives, smaller organizations “have both the largest percentage of current implementations and the most ambitious plans over the course of the next three years”. 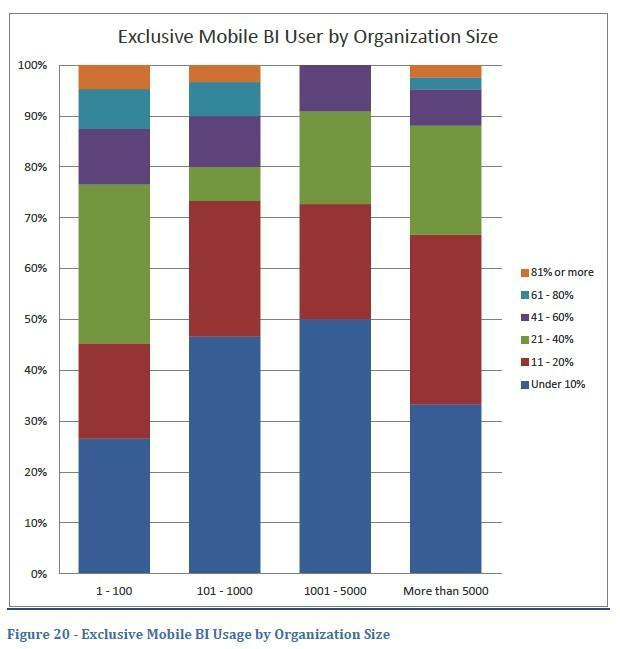 Dresner’s 2011 Mobile BI market study also demonstrates that a higher percentage of employees at smaller organizations receive BI via mobile devices exclusively.